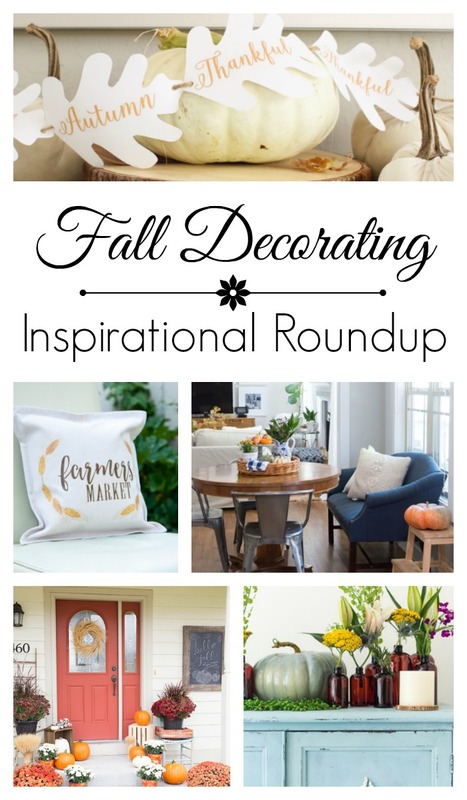 This weekend is going to be busy so I’m popping in with fall decorating inspiration from several of my blogging friends. Every year when I look at their fall home tours I’m even more impressed than I was the year before. It doesn’t seem possible, but the creativity level of my fellow bloggers just seems to be getting better and better. 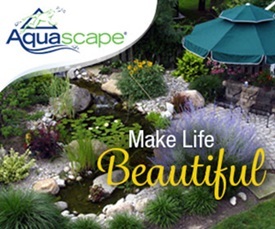 I trust you’ll find decorating inspiration from them that you might want to include in your own homes as we head into the beautiful month of October. Kristen at Ella Claire has a beautiful fall tablescape in soft, fall colors. Note the individual loaf of home-baked bread at each place setting. 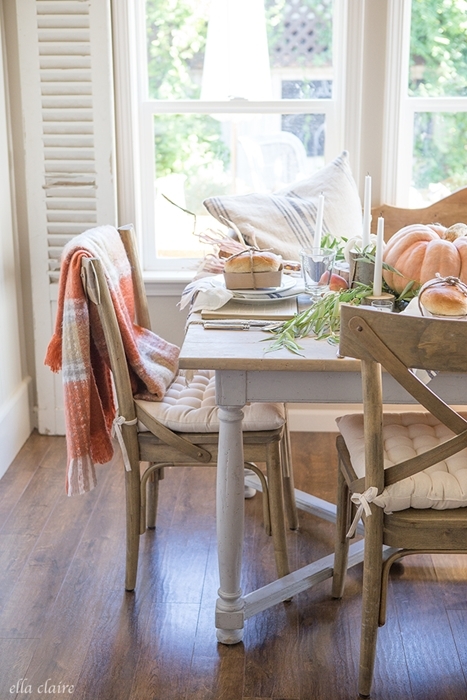 What a cozy way to introduce fall into your dining room. If you read my blog you know I love vintage bottles in every color. 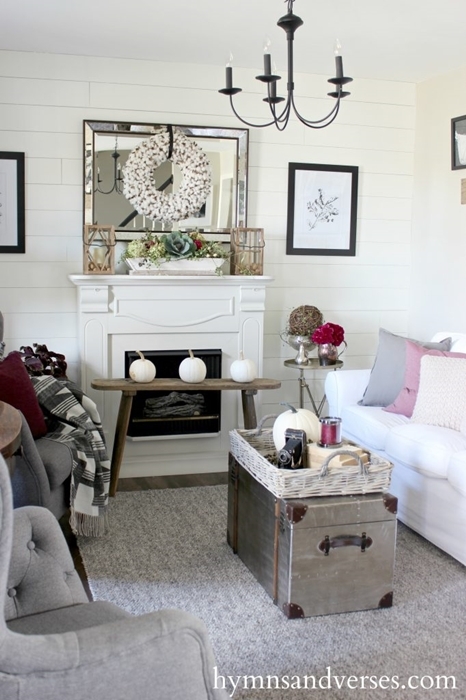 Danielle at Finding Silver Pennies has such a pretty vignette on display in her fall home tour, with inexpensive brown bottles and beautiful flowers. Got pumpkins? Stuff them into your fireplace and let them spill out. 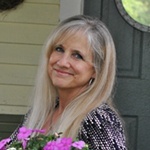 Julie Blanner shows you how in her post about favorite fall decorations. What a cute and clever idea! 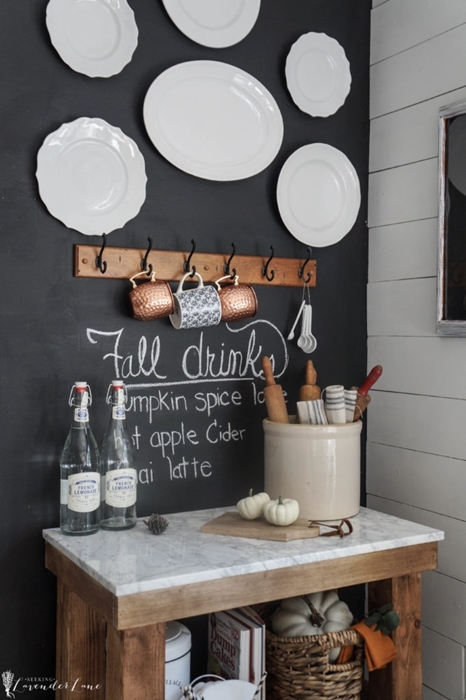 Nothing brings cozy to a kitchen like a Fall beverage bar. Deb at Seeking Lavender Lane gives her drink oasis a rich backdrop with a chalkboard wall. 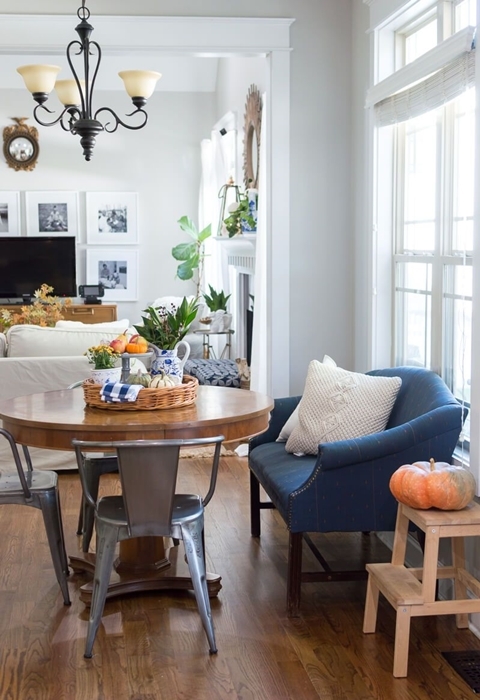 I love the drama that this space adds to her fall home tour. If you enjoy a little romance, you’ll love this jewel-toned fall tablescape by Janet at Shabbyfufu. I recently discovered a new-to-me blog that leaves me wanting more! 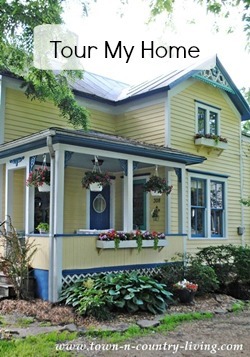 You’ll love Linda’s eclectic fall home tour at The Home I Create. I can’t stop looking at this view of her living room from her dining nook. 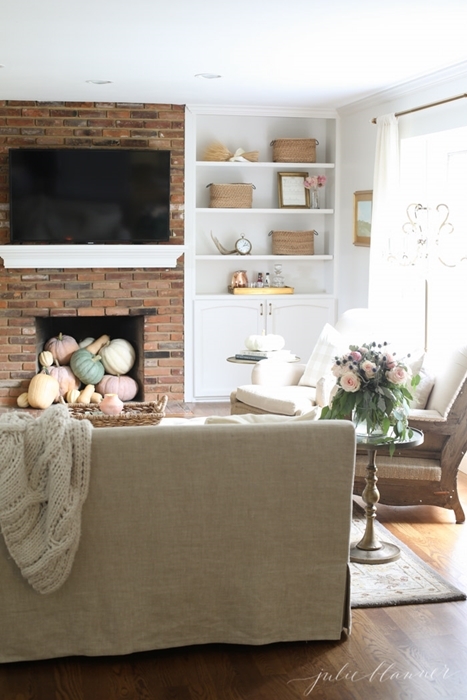 Doreen at Hymns and Verses creates an understated fall living room. 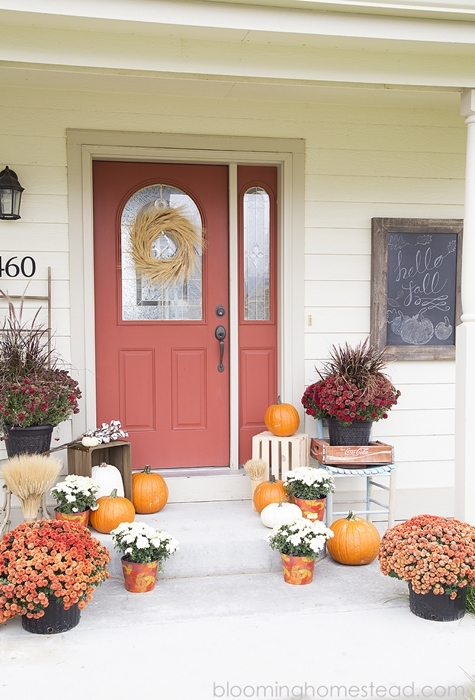 I love the colorful pops of ruby paired with white pumpkins and a cotton wreath. 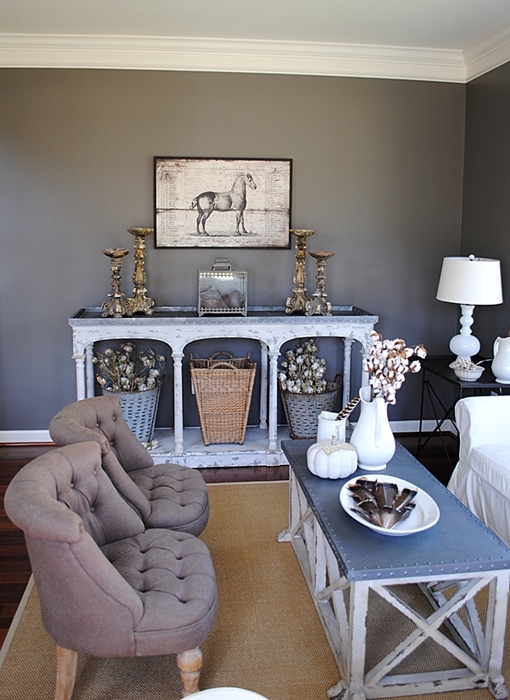 Dark gray creates a dramatic backdrop in the sitting room of blogger Karen from The Graphics Fairy. 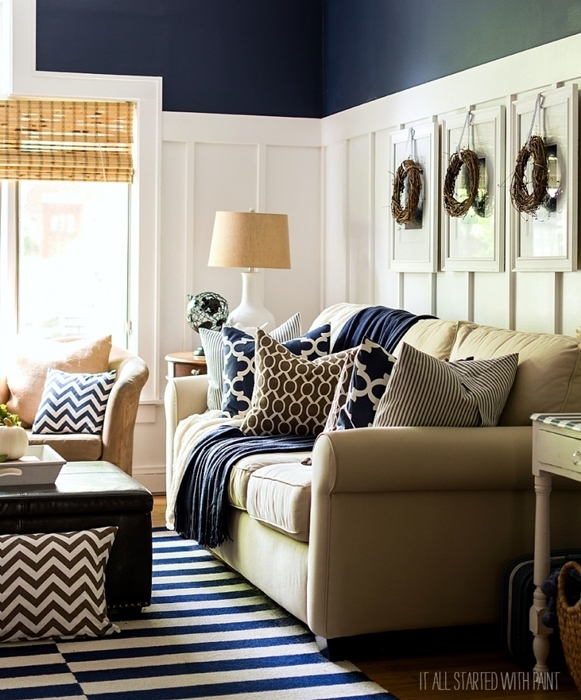 Navy and white also create a dramatic effect in Linda’s living room at It All Started with Paint. The geographic-print pillows adds a refreshing and modern twist. Are you up for a pretty fall pillow? 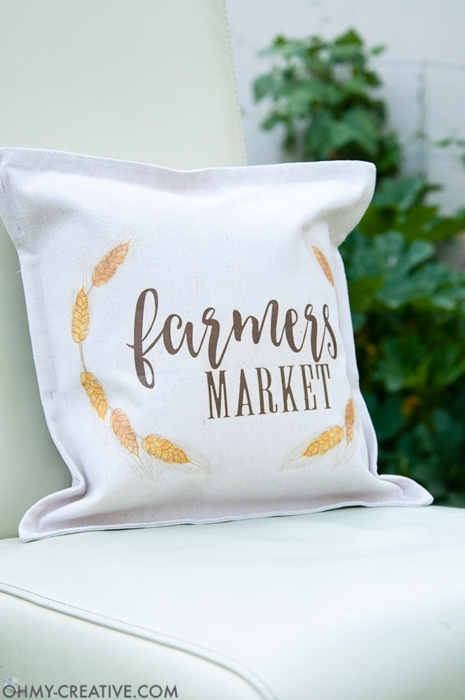 Susan shares the tutorial for her Farmer’s Market pillow at Oh My Creative. If you’d like a bit simpler craft, give this fall leaf garland a try from Janine at Happy Happy Nester. 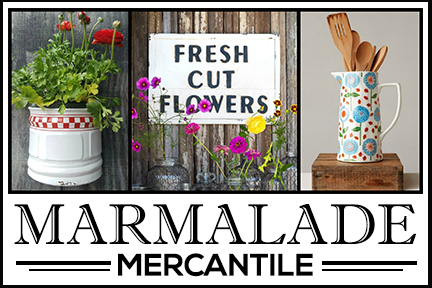 Marie at Blooming Homestead created a colorful and cheerful front porch. Her front door is the perfect color for the season! 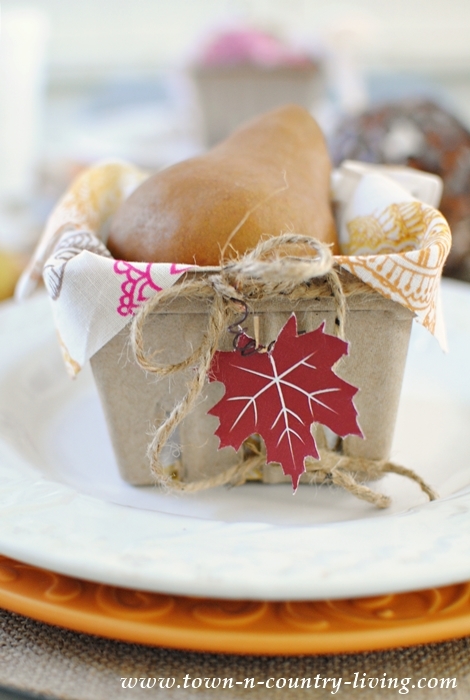 One of my favorite projects from fall this year is my small leaf printable that I used in a fall table setting. 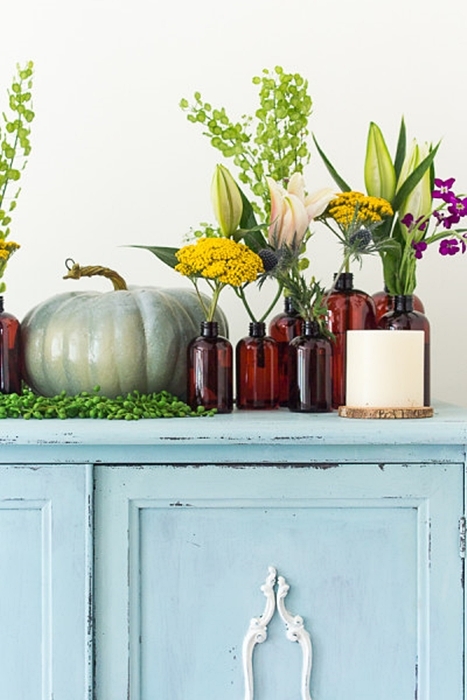 I hope you enjoyed this roundup of fall decorating inspiration! 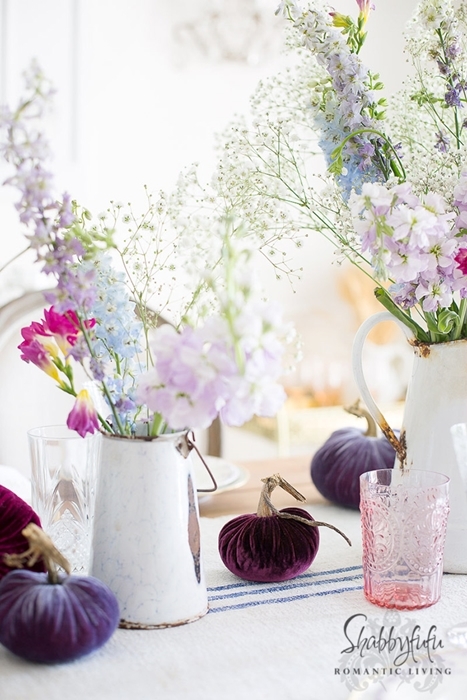 Be sure to visit some of the bloggers above for even more decorating ideas! And come back tomorrow for the first of several Christmas crafts! So many great places to see and lots of ideas. Thanks for this post. Great inspiration. I’ve got to check out these bloggers. I had not heard of some of them. Thanks for sharing! Great collection. Come over and share at The Fabulous Fall Party! What a lovely surprise to see my leaf garland in your fall collection! You brought a smile to my day! Thank you so much and I hope you have a great weekend. Btw, I LOVE your small leaf printable too! There is lots of great inspiration for fall, they are all so pretty! !